With that out of the way, let’s get down to some chess updates. March ended with some mixed results for our teams – match reports follow. 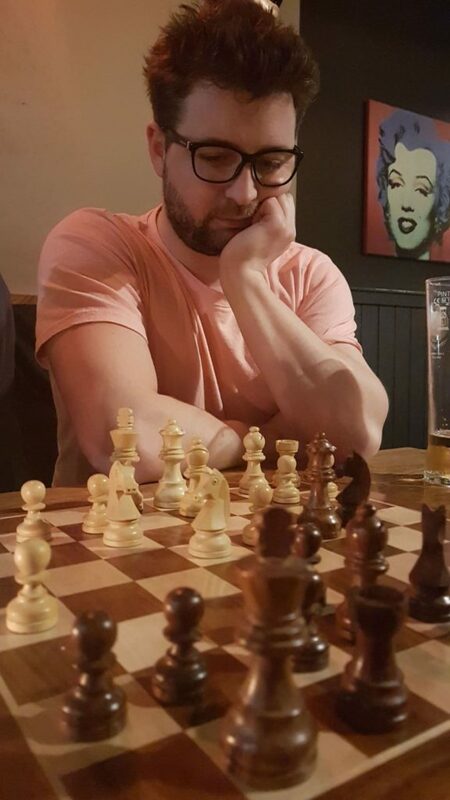 We’re also really excited to be able to share a very interesting evening at Battersea Chess Club coming up tomorrow – Tuesday 3rd April – and some details on the ever-growing casual chess scene at Hammersmith. Read on! From a captain’s point of view, Monday’s match v Willesden started several days before the first move was made. We knew we needed to field a strong team to stand a chance of winning, and eight of the best Hammerites were fit and ready to demonstrate our mettle on away turf. On Friday, the opponents announced their venue was shut & promptly called the match off… before asking to play at our place instead. Game back on! After assuring me they would only be able to field seven players, I was a bit perplexed when they turned up with eight. Coupled with several members of our team being drafted into the firsts at the last minute, I was left scrambling for players – a big thanks to Ben, Eva and Wyatt, who stepped in at the last minute. We were well out graded on every board, but played some good chess. Pouya narrowly lost as well, so it was down to our lower order to try and salvage something from 3-1 down. They came very close – Ben, Jeremy and Wyatt made well-earned draws, and Eva pickup up her first win for the club. So we ended the night second best – losing by a single point. We go into our last two games in a four-way race for the two promotion spots. Next up is a crunch match against Muswell Hill, which may well determine our fate. Hammersmith Hedger suffered our heaviest defeat of the season this week, going down 3.5-0.5 to arch-rivals Battersea. Robin played black on Board One, securing the half-point. Having a solid setup, he held the position, giving away very little, ultimately settling for a draw in a King & pawn ending. Nick played black on Three, having two active Bishops. However he had saddled himself with three isolate pawns and ended up resigning after losing the exchange. In Nick’s defence, he was facing an opponent the best part of 30-points higher than himself. John’s opponent gave up the exchange to open an attack on John’s King. John defended it well and adjourned. However, after reviewing the adjourned position he decided the position was lost and resigned without resuming. Dan on Board Four had worked his way into a decent position, however he ended the evening very disappointed as he fell for a mate. 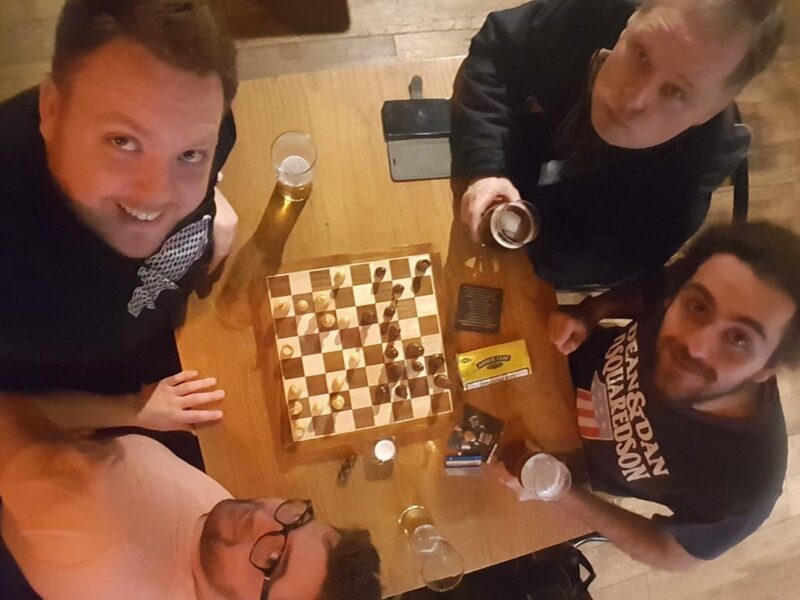 No match report for this one, but we are delighted to report a Hammersmith victory, 4.5-3.5, which means promotion to Division 1 is near-guaranteed. 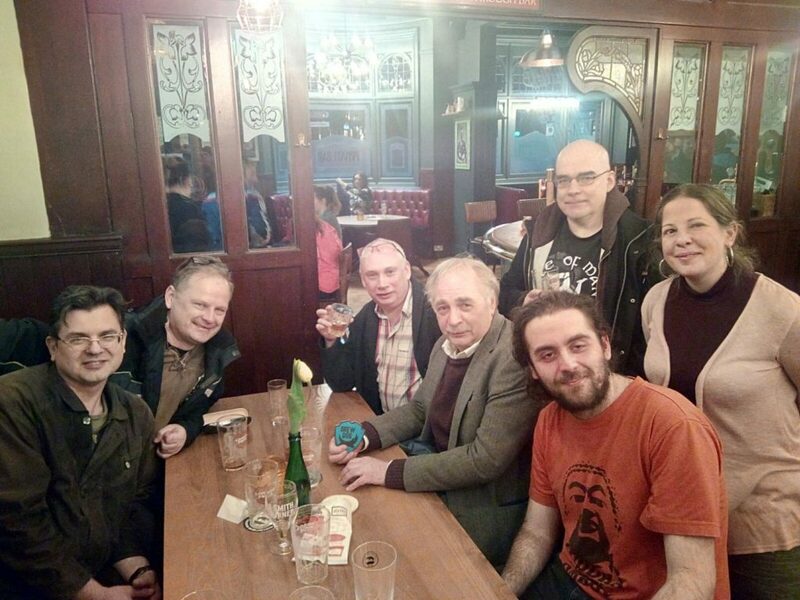 Great to see both teams enjoying a bit of post-game conviviality afterwards too – the spirit of chess alive & well! 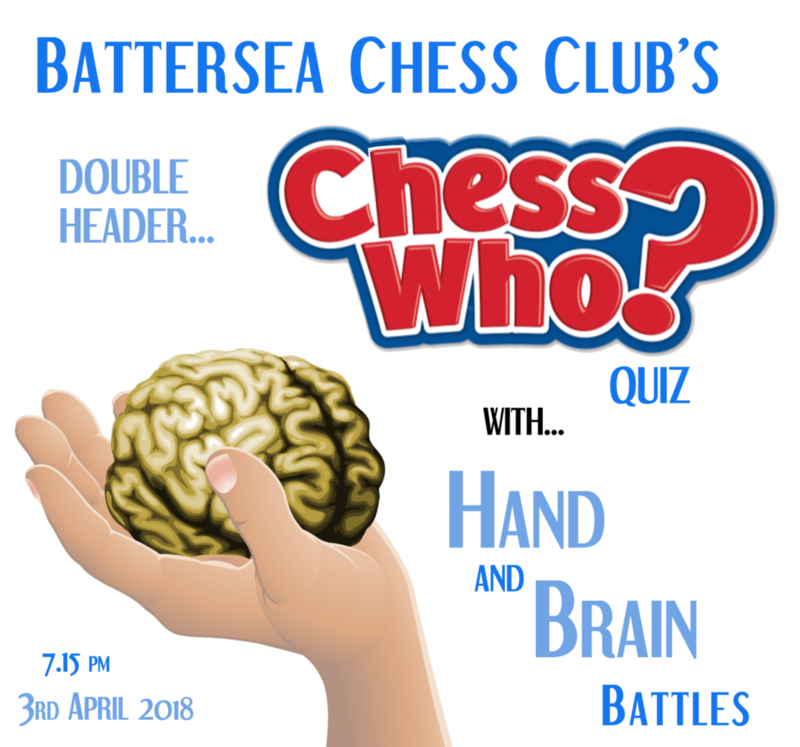 Our good friends and noisy neighbours down in Battersea will be hosting a chess-quiz-double-header this Tuesday evening from 7.15pm down at their home venue (the Battersea Labour Club, 5 minutes from Clapham Junction – cheapest pints in London!). Full details on their website – link below – but in brief, there’ll be a bit of a “guess-who” round of famous chess players, followed by an eight-round tournament, all of which will count towards your points total for the evening. It’s an activity aimed at all levels – new players will be paired with stronger players to make it as balanced as possible – sounds like fun to us!! Start Time: 7.15pm sharp – there’s a lot to get through! Hammersmith’s Burgeoning Casual Chess Scene! And last but not least, we wanted to let everyone know about our extremely popular and ever-growing casual chess scene! 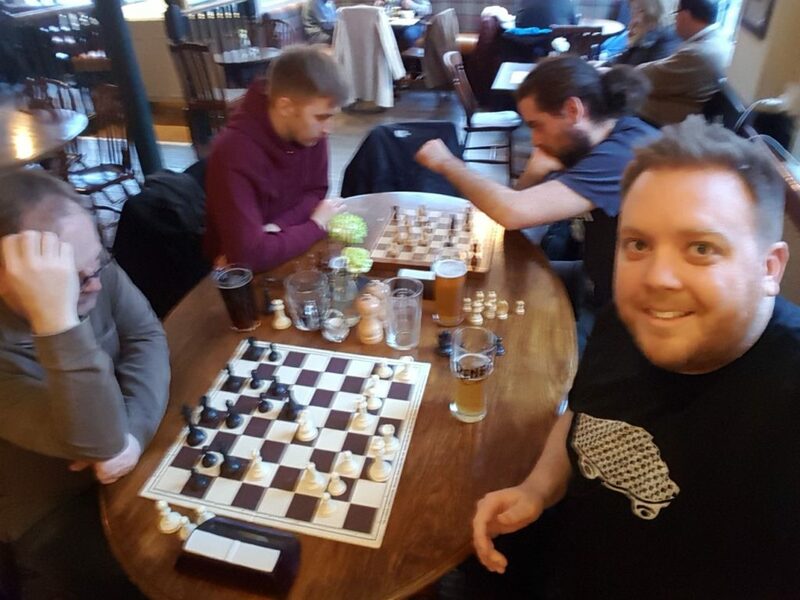 Started by a handful of enthusiasts from the club, we are now seeing regular meetups on weekends and during the week, of like-minded individuals who want to enjoy a bit of chess, often (but not always!) in a pub with a drink or two. It’s a really fun, social & ever-evolving – and we want to encourage it as much as possible! If you’d like to get involved please get in touch with our man (mostly) at the helm, John White: john.white49@ntlworld.com, or leave a message and we’ll add you to the Club WhatsApp group (aptly named “HammerTime“), where most of this gets arranged (30 people and growing!). Previous Previous post: The AGM – Constitutional Edition!